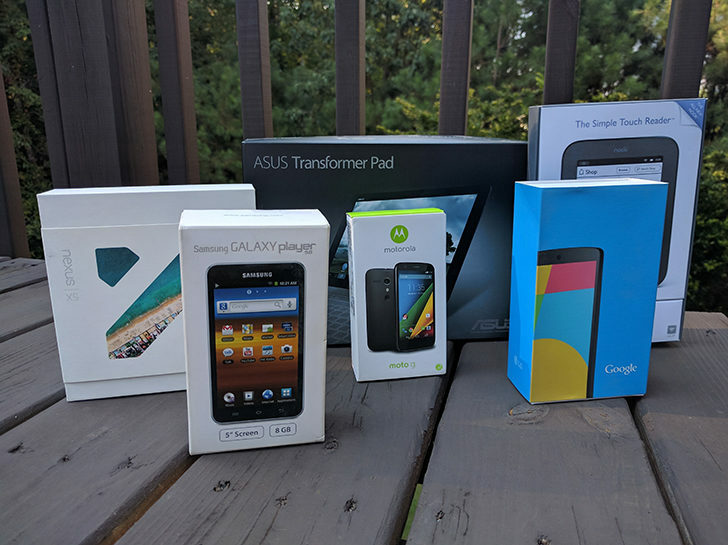 The boxes of all my Android devices (minus the watches). When I started writing for Android Police earlier this month, some of you recognized me from when I installed Windows 95 (among other things) on my watch. But outside of me shoving emulators on my watches, I've worked on some cool projects and spent way too much on electronics. I started trying to learn development when I was around 12, armed with a copy of Adobe Dreamweaver CS3 and my iMac G5. A year later, I started developing extensions for Google Chrome, which I still work on to this day. I still regularly update my first extension, Wikipedia Search. Some of my other extensions include NoPlugin and Peek, which are also available on Opera (if you don't mind your data being leaked). Technically my first Android device was the Nook Simple Touch, which ran a heavily-skinned Android 2.1. I figured out I could root it and get the full Android Market (remember when it was called that? ), and it was fun to mess around with. My next device was the Samsung Galaxy Player 5, which Samsung neglected to update past Gingerbread, leading me to discover the wonder of custom ROMs. Then I grabbed the ASUS Transformer TF300T shortly after, which I would still be using if the memory had not degraded to the point of being unusable. Nexus 7 2012 owners, you know what I'm talking about. The Nexus 5 in 2013 was the first device I fully paid for myself, and as I'm sure many of you will agree, that phone was great. My next phone was the LTE model of the original Moto G, after my Nexus 5 died. I was pretty happy with the Moto G until I saw Google announced the Nexus 5X, and I got it a few months after it was released. As for wearables, I bought the Samsung Gear Live shortly after it came out. I then received a Moto 360 a few months later from the Android Wear Product Manager at Google, after my videos went viral. After said Moto 360 died a few months ago, I grabbed an original LG G Watch from eBay.